경주 황남동 상감 유리구슬(慶州 皇南洞 象嵌琉璃玉)는 경주 황남동에 있는 신라 미추왕릉에서 발견된 길이 24㎝, 상감유리옥 지름 1.8㎝의 옥 목걸이이다. 8가지 정도의 옥을 연결하여 만든 목걸이로, 대부분의 옥이 삼국시대 신라 무덤에서 자주 출토되는 편이지만 상감유리환옥은 처음 출토되었다. 작고 둥그런 유리 옥에는 녹색 물풀이 떠 있는 물 속에서 헤엄치고 있는, 오리 16마리와 두 사람의 얼굴이 지름 1.8㎝의 작은 표면에 여러 가지 색을 써서, 세밀하게 상감 되어 있다. 유리 옥의 제작지가 어느 곳인지 분명하지 않지만 얼굴 모습이 우리나라 사람과 차이가 난다. 수공 기술이 놀랍고 색조의 조화가 아름다운 걸작이다. 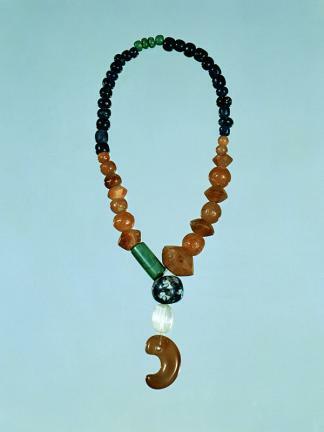 This jade necklace with inlaid glass balls was found in tumulus No. 4, area C of the Tomb of King Michu in Hwangnam-dong, Gyeongju. The diameter of the glass balls is 1.8cm. Roughly about 8 kinds of jade were used in the necklace. It was severely damaged at the time of excavation, but the present form was retrieved on the basis of this impaired piece. Although jade pieces are quite frequently excavated from Silla tumuli, this is the first inlaid work of glass balls to be unearthed. 16 ducks swimming among waterweeds and a person's face are elaborately inlaid with various colors on the surface of the spherical glass jade which is only 1.8 cm in diameter. It is not certain where the glass jade was manufactured, but the face inlaid on it does not look like that ofa native of Silla. The manufacturing skill is amazing and the proportionate use of colors along with the skill completes a true masterpiece. King Michu was the thirteenth king of Silla. He acceded to the throne in 262 and reigned for 23 years until 284. The Tomb of King Michu is otherwise called Jukjangneung (Tomb of Bamboo Soldiers) or Jukhyeonneung (Tomb where Bamboo Soldiers Appeared). Samguk sagi or ‘The History of the Three Kingdoms’ tells about the legendary origin of this name. In 297 (the 14th year of Michu’s son, King Yuri’s reign), Iseogoguk (a nearby tribal nation) invaded Geumseong, the capital of Silla. Soldiers of the Silla Kingdom went out to meet their enemy but could not fend them off. At the critical moment a host of soldiers appeared. Their numbers were countless and all of them had bamboo leaves stuck behind their ears. They fought together with the soldiers of Silla, defeated the enemy, and then disappeared. Afterwards somebody noticed a heap of bamboo leaves on King Michu’s Tomb and this led people to say that the dead Michu had helped Silla with his secret army.